I slept late this morning after Friday night's bizzare sleeplessness. That didn't leave much time for futzing around on the Internet before I had to pack the car and head into Boulder for the Boulder Bike Swap. I was able to sell my old Mongoose mountain bike and a bike rack/basket, which is great since it means a lot less craigslist hassle for me to pare down my bike gear to what I currently need. I also picked up a set of full-finger mountain biking gloves that should be safer than my fingerless gloves for my ever-more-frequent crashes. Then Mike, Jeremy, and I headed up to the West Magnolia trails in Nederland and biked around for two hours. The new Stump Jumper M4 rides great and the trails are really fun. Might be a minor issue with shifting down to the small ring on the front gear, but we'll see. After that I had to immediately head home and very efficiently get cleaned up for my next appointment which was an OKCupid date in City Park in Denver. I managed to get there not too late and we hung out under the pavillion as it was spitting light rain sporadically. We played some banagrams, ate chocolate, and listened to music. Then it was off to aerials class for me. I learned a double drop and practiced it a few times. The day goes on. 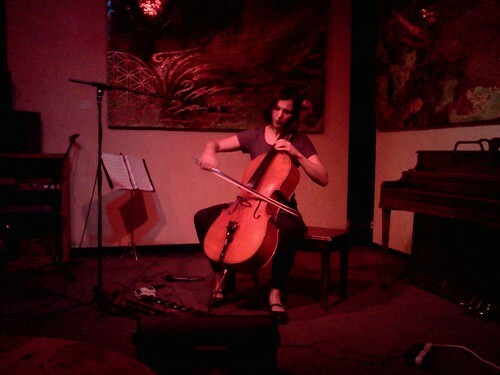 8:30pm I leave aerials class and drive to Boulder to hear Hellen Gillet played cello with a looper pedal. Alice was there and I was starving so I had a bowl of their apple smoked bacon and white bean soup and a burrito. Hellen was really fun to listen to. Not as fascinating to me as Zoe Keating, but really sharp with her Boss RC-50 looper pedal. And that, folks, is a "relaxing" Sunday for me these days.